I once tried to leave Washington, DC, uproot my family, change jobs, and settle permanently among the Green Mountains of Vermont. Ultimately, I called off the effort and decided to stay (at least for the time being,) and I can happily report that I am at peace about it. I talked about this experience in June as part of my post How Your Mountain Dreams Might Be a Trap, and it spurred a lot of comments and a few direct messages. When I was younger, my Uncle Tom brought me on adventures hiking and climbing in the Adirondacks. Those trips make up many of my formative experiences. When he passed away from cancer, too young, shortly after I moved to Washington, I lost the only person I knew who understood wilderness from experience. I moved to Washington for my career, and for the first 10 years, while I was fulfilled in my job (and still am,) I felt lonely except for my wife and work colleagues. Nobody I knew shared my interest in the outdoors like I did with my uncle. Camping. When I say I love camping someone might want a road-side camp involving a stereo, cooler, charcoal grill, and a big motorboat. I want the backcountry with quiet, a small stove, and having walked in. Trails. When I say I love trails someone might want to be on an ATV or dirt bike. I love trails for walking in the backcountry free from motor vehicles, and sometimes free from mountain bikes and horses too. 4WD. When I say I love my four-wheel-drive vehicle someone might mean that they love off-roading, mudding, and driving for thrills across big, open landscapes. I mean that I love my Subaru and that it gets me through the snow to ski country and down dirt roads to the trailhead, and once it gets me to the big open area, I prefer human-powered activities like hiking, climbing, kayaking, cycling, and so forth. So just like in Upstate New York, there were a lot of people around me that didn’t share my values or experiences. Without making city living an “us against them” game, which I was doing, I had to be blunt with myself about what I valued. I think, fundamentally, this is why I have always identified more with climbers than someone who calls himself or herself a hiker. When I did find people of similar interests and values for the outdoors, they were typically climbers with a naturalist bent. And most climbers on social media and the events that I have made friends with typically are. Since I realized this, I worry about millennials that came to climbing through a gym and have none or little background in respect for climbing outside, but that’s a conversation for another time. Access issues outside Nat Geo HQ. Who are You Without Climbing? In Alpinist 54, Hayden Kennedy shared in his article”Light Before Wisdom,” how climbing and climbing-success consumed him, and after an injury, he was forced to face a question similar to mine: “Who am I without climbing?” He came to realize that there was more to alpinism than climbing. Campbell loved three things: running, legal challenges, and reading. They are his passions and while he considers himself fortunate, as many people don’t have even one passion, he is simultaneously cursed by having more than one. His ambition made him want to do well at both. Except improving at one meant sacrificing time that could be used to improve on the other. Campbell talks about the quest so many people talk about everywhere: elusive work-life balance. Natalie has learned, and sometimes reminds me that balance doesn’t mean 50-50; balance can be 70-30 if it makes sense and you accept it. She’s right. But I haven’t figured out what the right arrangement is either. For me, separating my career in Washington from my love for the outdoors and mountains, I realized was a problem. I could be in one place and love the other. Because I did and that was the truth about me. If that doesn’t quite make sense, I had to mull over this notion for months until I even started to put it into practice. But the guilt (or frustration with myself) is nearly gone now. For those of us in a densely populated urban area, some interests and hobbies are more easily fostered than others. Baseball, like all pro sports, for instance is easier to come by. It’s broadcast half the year, ballparks are almost everywhere and people of all ages can participate, even if it’s just softball. While on the other hand, a passion for mountain life must be conjured-up and summoned in different ways. These are the things that I have learned to practice that help me cope with my unsettled need for the mountains and outdoors. Gyms. Embrace indoor rock climbing. I’ve always climbed indoors, but I never really embraced it as legitimate climbing and a place to enjoy. The gyms are almost everywhere these days. There you can go and keep practicing your footwork and knots with purpose. Once I got over being the old guy at the gym that boulders alone, I started visiting regularly and loving it. As a general principle, the act of climbing (hiking or whatever) is more important than reading and discussing it. Visit. Visit isn’t actually the right word; rather make pilgrimages to the mountains and treat them as such. Keep the time special and disengage. Really disengage. Even if it’s only once a year. Sanctity. Have some sacred things. For me it’s a fleece pullover, my boots, and my tin camp mug. They only come out when we go outdoors, even if it’s just Cactoctin Mountain. Reminders. Buy souvenirs when you’re at the places you love. They’re only tacky in the shop. When you get home, people see that hat or mug from your destination and strike up a conversation and boom: You’re talking about your trip. Subscribe. Subscribe to your favorite climbing magazine. For me, it’s Alpinist. Having something fresh arrive in my mailbox periodically about climbing awakens my senses, at least in my daydreams after reading. Clubs. Join the American Alpine Club, Access Fund, and whatever local conservation group is in your area. Then show up to the local meetings or special events when they come through. Advocate. 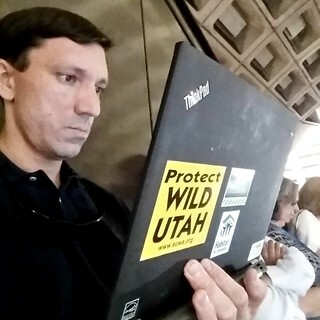 I do advocacy and government affairs for a living, but my favorite work is when I am volunteering to support the Southern Utah Wilderness Alliance, Alaska Wilderness League, or responding to whatever call-to-action the Access Fund or Patagonia sounds. Speak up for what you care about, even if you’re just signing a petition or persuading a friend (without fighting) to change their position. Gear. I don’t mean getting new gear. New gear without being put to action empties the wallet and doesn’t fill the void in your heart. I used to buy gear and gizmos (I have a backpack fetish, it seems) to fill the void of actually going outside and playing. So resisting buying things I don’t need was important to put money into the gym and the pilgrimages. In the end, I got way better value. Read. I have always been reading climbing books, from classics by Dave Roberts, to long forgotten like books by John Long. Reading books nominated for the Boardman Tasker Price for Mountain Literature or Banff Mountain Book Competition never disappoint either. 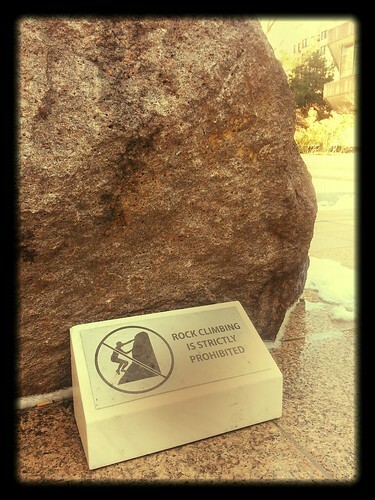 You have to be careful when you get jealous over the subject’s dedication to the climbing or vegabond life sometimes. If that happens, take a break and look at yourself as a whole again. Working for Banff on the subway. and it’s our getaway car for reaching quiet places where we can skip stones. Just don’t cover your new ride with stickers if you’re over 30. And if you’re not living in it, which I’m guessing you’re not. Save those stickers for your laptop. If all else fails, move to the mountains. Get the support of your loved ones. Transfer the job or find a new job. If it doesn’t work, then you tried. I tried; the timing wasn’t right, and I’m more at peace for trying so damn hard. Thanks again for stopping by. If you enjoyed this post, please consider following The Suburban Mountaineer on Twitter, Facebook, and Instagram. Once, only vertical columns of ice and knife-edge alpine ridges enraptured me. Then a brief visit to the American southwest started to change that. Soon after, photos of the crack climbs around Indian Creek grabbed my attention. The future of climbing in Indian Creek is now in the midst of a political game of tug-of-war. U.S. Representative Rob Bishop of Utah is proposing a bill that, among other things, would preclude any executive order by a president to name any further national monuments in Utah. He points out that the whole Utah Congressional delegation opposes the Inter-Tribal Coalition’s proposal. That last point is important, because, as I know from my days as a Congressional aide, the President is well aware that he should not take action affecting a particular state without support from the state’s elected representatives. If Obama uses his executive authority and designates Bears Ears National Monument without due process, without input broader than the Congressional delegation, then Obama’s actions could be contested, overridden, and ridiculed as poor governing. Bishop has cleverly complicated efforts by introducing legislation that involves how federal public land in Utah would be managed in the future. (An updated version of his “Utah Public Lands Initiative” bill comes out today.) So long as this proposal is under discussion, the President has to tread extra-carefully; Congress has the power of oversight, spending, and authorizing. And most of Congress is staying on the sidelines, for the most part, in order to leave Utah’s delegation to have its say about its home turf. In addition to prohibit designating a new national monument, the bill alleges to “balance” industrial development and conservation efforts, but in reality it conserves new land in Northern Utah, not the canyon county in the south of the Cedar Mesa Plateau. As a lobbyist with a large national nonprofit, I recently attended a similar public meeting, on a different subject (payday lending), in Kansas City in June. But the reasons for the meeting were similar. It was about the Obama administration wanting to take action it felt was shared popularly by the public, but opposed by Members of Congress. The meeting documented the statements from ordinary people and people with a direct stake on the topic on both sides of the issue. The forum also generated press, which made people speak up and take sides. It was a critical moment to drive and expose public interest and support for where it genuinely lies. From my perspective in DC, this is the highest profile public lands fight right now. And it has ramifications for other proposals, like turning back larger swaths of federal public land in multiple states back to state government control that could turn it over to industry for resource extraction, rather than the recreational and conservation purposes Americans from coast-to-coast rely on. There will be more key moments in the effort to make Bears Ears National Monument, but this is the time to either show up and speak in Bluff (RSVP here), even if just to say you support the Inter-Tribal Coalition’s proposal, or write to President Obama by clicking here. And join the Access Fund, American Alpine Club, and/or Southern Utah Wilderness Alliance, because the work won’t end here. Speak up for Indian Creek, Bears Ears National Monument, and conservation, because there is more at stake than just Bears Ears. Death from a climbing or skiing accident is hard to swallow. Suicide, by anyone, let alone a climber or skier, is more difficult because, well, it wasn’t an accident. Which made Kelley McMillan’s piece in National Geographic’s Adventure Blog, “Why Are Ski Towns Seeing More Suicides?“, alarming. The piece is focused on the ski towns, yet the data presented didn’t demonstrate that it was unusually higher in those communities than others, but I agree that the suicides were higher profile anecdotally. And it had an extra dose of being unsettling: How could people in paradise, living the dream, want to end it all? Was paradise killing us? My whole life I have wanted three things: A family, to be involved in politics and policy, and playtime in the mountains. With the first two down, several years ago I committed myself to make a big change. With every ounce of my being, shortly after Natalie and I had our first child, I tried to relocate us up north to the land of mountains and snow. I dreamed of snowy days like in a Patagonia catalog where my kids and I would cross country ski after I finished work, and where chopping fire wood would be my favorite chore. I networked like mad from our home in the Washington, DC metro area for eight months and traveled to Montpelier and Burlington to do informational interviews with Vermont housing organizations, the Vermont Energy Investment Corporation, and some mortgage companies. I even submitted applications to Ben and Jerry’s parent company and Green Mountain Coffee. I began to have back pain that came only in the night. I would sleep for a few hours and had to sit up, or better yet, stand up. Even being up at 2:00 a.m. with Wunderkind, feeding a bottle, brought pain relief, but then I suffered from sleeplessness. I had X-rays. I went to physical therapy. I thought the pain was from not being strong enough. I though it was from the stress of being a new father. If the job hunt was the cause, it never occurred to me. I got interviews for open positions. It excited me; I felt that I was in control. But during the last day of my “informational interview tour,” I literally made a wrong turn. I saw some neighborhoods with some young Vermonters and they didn’t look happy. They didn’t look like skiers or even boarders. They were in a different Vermont, where it was cold, and dreary, and the urban music scene they craved didn’t exist. Days later I quit my job hunt. I knew I could call Vermont home, but would my kids find it as fulfilling? I didn’t want to test it now. Hardly noticing, my back pain faded away, at first, inexplicably. I still think that regularly ice climbing in Smugglers Notch or hiking sections of Long Trail would make me happy. Not to mention stopping in at the Alchemist in Waterbury for a Heady Topper whenever it was freshest; it sounded too good to be true. Yet I’ve recommitted myself to the Washington metro area — and I’m good with that for now. While I love the things I go to Vermont to visit, the reality of the day-to-day might be different than I imagine. The job market is weak, and even then I know people move to the state and buy a house near their job in one neighborhood only to change jobs and be forced to commute an hour one-way. And what would the length of winter and mud-season do for my family being inside more; would we really play outside as often as I think we would? Would we feel cabin fever? Vermont’s suicides have risen in the last two years. In fact, the suicide rate has risen to a 30-year high, and it is the leading cause of death for young Vermonters (among those aged 10-24). Since settling on — or, perhaps better put, re-committing to — Washington, DC, I’ve been diligently accepting it as home. It has taken some work; I had to embrace the humidity of summer (baseball games help). And I finally think of the subway as a luxury. I also started planning more regular getaways to New England despite the long-haul drive up north. My family and I might, one day, still move to the mountains. If we do, it will be because of the mountains are the “bonus” to so many other things that we want, including good schools, an affordable home, steady income, and healthy lifestyle options for all of us. For now, I’m working on making it work here in and around the big city and visiting the mountains in almost sacred pilgrimages during breaks spread out in between. While we might want a change, the change of surroundings isn’t always what we need. Sometimes the change we need is all in our head. A couple of years ago Jason Stuckey shared with me his high-resolution photos from his first ascent with Clint Helander of Apocalypse Peak in Alaska’s Revelation Mountains. I recently stumbled upon them cleaning up some files. They’re dazzling. Dizzying. I zoomed in on Clint. 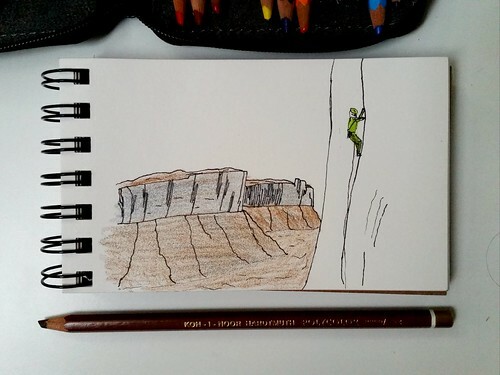 At first he appears as a mere stick figure on a steep snow field, but closer in I could see the contours of his helmet, and count the number of pickets and screws hanging on his harness. Then, I saw something I hadn’t noticed before: Clint was looking in the same direction Jason was, and I was, in taking in The Angel, another 9,000-foot tall mountain (9,260 to be precise) over the valley. He had made the second ascent a year earlier. Looking at these photos from my laptop in my Washington, DC-area condo at 6:30 a.m., I feel a sharp, cold gust brushing my exposed skin, and a little where it isn’t. The clean, unfiltered sunlight is blindingly bright even though my lenses are dark, almost black. It’s a bluebird day, rays bouncing sharply off the snow. And I can imagine my calves stretching, getting oddly warm in an unwelcome way, as I’m standing on my front points. Then I remember that I have to wake the kids in an hour, and I am supposed to cover a Congressional hearing on the Hill at 10:00. I must remember to wear a tie today. I need to be there to know what the tone of the meeting was and whether any promises were made so I can hold them accountable. If I don’t, no one else will. At least that’s what I strongly believe, even if it might not be entirely true, or necessary. Damn it. I want to be here. Living with my family. Fighting for my cause. But I want to be in that photo too. Adam Campbell, an Arc’teryx ultra-marathoner, lawyer and reader, wrote an essay in the fall-winter issue of the brand’s Lithographica publication titled, “The Passionate Divide”. Campbell loved three things: running, legal challenges, and reading. They are his passions and while he considers himself fortunate, as many people don’t have even one passion, he is simultaneously cursed by having more than one. His ambition made him want to do well at both. Except improving at one meant sacrificing time that could be used to improve on the other. Is climbing still mainly an outdoor activity in the mountains? That’s the way I prefer it. But climbing is in just about every peakless metro area through gyms. Even when I go climbing these days, it’s mostly indoors. All that’s great except when it’s the outdoors that we crave. And this presents the issue that Campbell’s approach can’t resolve. Campbell’s approach has shed a lot of light on my passions for being a stronger climber, better at my job, a better husband, a better father, a better fantasy baseball manager, and a better artist. I realized that I compartmentalize things too much. Which means I often played king of the mountain with my passions. Now I realize that it’s okay so long as I recognize that they are not competing against one another. After contemplating this for a long time, I’ve realized that our self identity isn’t just made up of one thing, even if it’s one thing at a time. One word can’t describe most of us, whether it’s climber, friend, or guitarist. We’re the combination of many things. And though we may not be great at any of our roles, the sum total can be beautiful. In fact, for us flawed mortals, perhaps only through the whole can we be beautiful. However, resolving the turmoil of the passions that I can enjoy in and around this city where I live is one thing. I even have to work at trying to be comfortable and embrace the urban lifestyle. (I think I am doing better than I was a few years ago.) It is the passion for a job in the city versus a more wild surrounding that I am still having trouble resolving. Resolving it for passions — which are, broadly speaking, hobbies — is a different matter than the environment. Looking again at Jason’s photographs, I sit quietly and feel the wind and absorb some of the sun’s rays. I imagine loosening the pic of an ice ax, being careful not to break it, and reaching higher to chip into a firm bite of ice. But I’m not in Alaska. So maybe after the hearing, I’ll leave work early, get Natalie and the kids and go play by the river. That actually sounds pretty darn good too. Thanks again for stopping by. If you enjoyed this post, please consider following The Suburban Mountaineer on Twitter and Facebook. At around 3:37 p.m. in the Karakorum, Alex Txikon, Ali Sadpara and Simone Moro radioed that they have made the first winter ascent of Nanga Parbat. According to sources reported through Raheel Adnan, of Altitude Pakistan, the day was beautiful without even a cloud. The descent is underway right now. So while the first ascent has been made, the climb is only half done. Good luck on the descent! So that leaves K2 as the only 8,000-meter peak left unclimbed in winter. In other news, the American Alpine Club is holding it’s Annual Benefit Dinner this weekend right here in town (Washington, DC). It’s like a mini-conference. Tonight is a members only (free to attend) Climbers Gathering at a local indoor climbing gym (not my local one, unfortunately), where well-known climbers will speak and several awards will be given, including honoring Katie Ives for excellence in climbing literature. Tomorrow there will be panel.discussions, a silent auction, and the main event featuring Conrad Anker and Damien Gildea to celebrate the 50th anniversary of the 1966 American mountaineering expedition to Antarctica. Also, if you haven’t heard, this year’s Piolet d’Or will award present the lifetime achievement award in April to Voytek Kurtyka. His climbing accomplishments, such as his work on Gasherbrum IV, and other ascents and attempts, were spectacular, and deserving of the award. 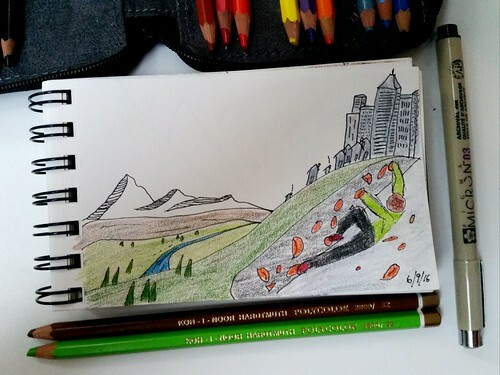 But he resonates with me, and other climbers, also because he has an almost mystic side and connection with nature (i.e it’s wild unpredictable side) that leaves himself open to the mountain. This time, leading up to the award ceremony might be a good time take a closer look at him and the little bit of writing he’s contributed to see what’s there for us. More on that later. The Bundy standoff in Burns, Oregon has lasted more than 40 days and the latest news says it may be coming to coming to a conclusion. It’s raised a lot of chatter about who controls the use of public lands. In fact, it’s inspired at least one of us: Over Facebook, Andrew Bisharat suggested learning from the Bundy clan’s effort and leading a crusade to take over the fish hatchery (which is actually on private land) so that we can climb the lower half of Rifle, CO, where it is currently prohibited. He was a joking. At least I think he was joking. There’s a lot of anger about government’s role today. It’s fueling the Bundy family and many like-minded ranchers. The anger, though over various topics, prompts many Presidential primary candidates’ supporters. Generally, the current system and values expressed by our laws and put into practice doesn’t work in their favor and they are frustrated. When it comes to public lands, climbers are on the winning side these days. We can easily take for granted that we are allowed to climb most everywhere. Official land management plans allow for climbing in the most desirable locations. Bolting is permitted in the backcountry in some areas, within some guidelines. And, among climbers, most of us self-enforce good neighbor-policies through following Leave No Trace principals. But there some real threats to that system. The balance could shift. And it might not be in your favor any longer. The freedom of climbing — whether that freedom is about movement over rock and hills or overcoming the idea that something seems impossible to climb — is about a specific approach freedom. That application of freedom comes from how society values that kind of freedom. Most of us don’t think about it much, but we can climb in the Adirondacks, Yosemite, Red Rocks and everywhere in between because we’re allowed to. Every park has a management plan and that covers permissible and impermissible activities, from where you can make fires to fishing access, are covered and revised periodically. However, who is making those land management plans would change if the public lands they address were owned by someone else, like the state or local governments. Members of the U.S. House of Representatives have bills to relinquish millions of acres of federally managed and protected land to states and local interests. These are ongoing issues. And there have been ongoing issues like these that come and go onto our radar in climbing magazines and on social media. But these are real discussions that could shift who gets to graze their cattle where, how the ore beds are extracted, and where you can and cannot climb. NRA — It has a large membership that speaks up whenever their rights and freedoms feel threatened. And they contribute great deals of money. AARP — This may be the largest national organization in size, and they are vocal on only two issues (Social Security and Medicare) for the most part, but it ensures the issues are protected and even considered sacred. AIPAC — This group represents a small population of Americans, but it has an impressive infrastructure to mobilize advocates in nearly every Congressional district in the country with a reasonable amount of discipline. All three of these examples have two things in common: They have dedicated members and they write and call their Members of Congress and other policymakers when summoned to do so. Sign this petition from Protect Our Public Land, supported by the Outdoors Alliance, to go on the record that you support the protection of our public lands. I believe compromise is always possible. While the lower-half of Rifle might be out of bounds, I think we can secure climbing and better land management for everyone. Hopefully will will do it without sacrificing what we hold dear and how we want to use the land.